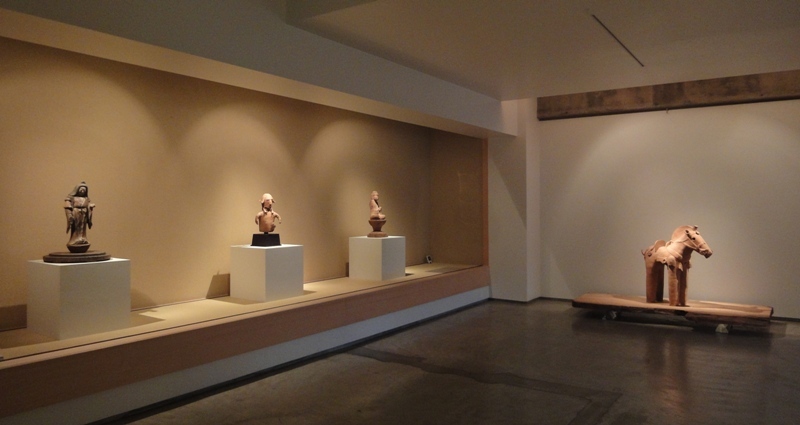 This time we are displaying larger pieces of sculpture that date from the Kofun to Heian periods (6th to 12th centuries). 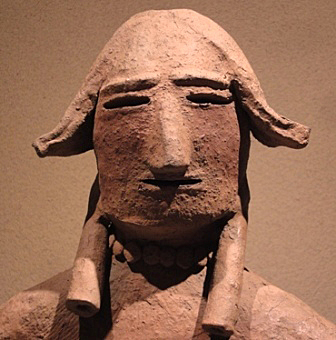 Let's begin with the story of what exactly haniwa are. Simply put, they are fired ceramic figures that were made to adorn the tombs of the deceased. Generally, it is said that human-shaped figures were made to act in the place of individuals who would otherwise follow their masters in death and be entombed with them while still alive. This is transmitted in the Nihon Shoki, but we know that human-shaped haniwa were made later, so it is most likely only legend. 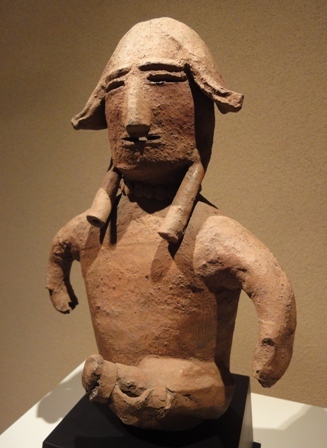 The first haniwa were cylindrical vessels made after the containers used in funerary rites held for the dead. Placing them around tombs marked out sacred space, and protected the spirit of the deceased. Eventually, haniwa shaped like human or animal figures came about, and were used in a variety of ceremonies and rituals. This is a male figure with a sword. Can you see the red pigment on the cheeks? He looks somewhat proud, don't you think?